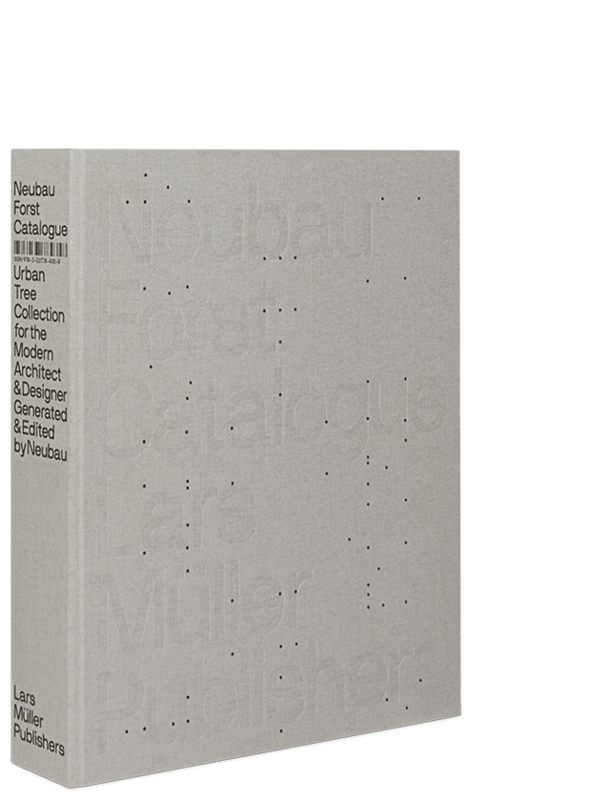 Neubau Forst Catalogue is the 432-page print catalogue of a digital collection of tree silhouettes and sculptures seen at different seasons. Working by hand, the Neubau designers digitally removed the trees from their original Berlin surroundings and thereby crafted a body of visual material whose scope, outstanding quality of detail and excellent image resolution sets it clearly apart from conventional tree libraries compiled with autotracing tools. The trees, which were systematically photographed in summer and winter over several years, assume a timeless validity through Neubau’s process of selection and are thus universally applicable for future visualizations. From the existing stand-alone tree objects, which can be placed against both dark and light backgrounds of all kinds, Neubau has furthermore derived individual “tree modules”. These modules can be combined with the ready-to-use trees in an endless number of ways. Alongside detailed information about tree species, size, location, year of planting and file format, the catalogue contains also numerous impressive examples of how these images can be used. The corresponding Neubau Forst Archive, consisting of 683 individual elements, is the digital library of which architects, designers, graphic designers and illustrators have previously only dreamed. Each book contains an individual download code that guarantees you an exclusive discount of 25% on purchases from the data archive in the standard image (TIFF) and vector (EPS) format.